I signed up for poetic book tours and l was email off Serena Agusto-Cox about reviewing this book. First of all I would like to say a big thank you to Mary-Elizabeth Briscoe for sending me this book and giving me the chance to read it. I want to say a big thank you to Serena Agusto-Cox for contacting me and taking the time to email me. This book has 256 pages and 32 chapters. Book Dedication: For aunt Pat and Mugsey, - Infinite love. For anyone who finds healing in our story. Poems from the start of every chapters. We do not heal the past by dwelling there; we heal the past living fully in the present. - Marianne Williamson. Our lives begin to end the day we become silent about things that matter. - Dr Martin Luther King Jr.
Life must be understood backward, but it must be lived forward. - Soren Kierkegaard. Sometimes our light goes out, but is blown again in to instant flame by an encounter with another human being. - Albert Schweitzer. Life changes fast. Life changes in an instant you sit down to dinner and life as you know it ends. - Joan Didion. Life shrinks or expands in proportion to one's courage. - Anais Nin. Just living is not enough... One must have sunshine, freedom, and a little flower. - Hans Christian Anderson. The ache for home lives in all of us, the safe place where we can go and not be questioned. - Maya Angelou. Sweet is the memory of distant friends. Like the mellow rays of the departing sun, it falls tenderly, yet sadly, on the heart. - Washington Irving. I go out there so l can look in to myself and when l am there I can see myself standing still and the rest of the world going mad. - Des Lavelle. It is our darkest moments that we must focus to see the light. - Aristotle Onassis. There is no grief like the grief that does not speak. - Henry Wadsworth Longfellow. Sometimes the questions are complex and the answers are simple. - Dr. Seuss. But that is their image of us, so we stay tense, holding are breath, hoping we won't be found out. - Ebine Yamaji. That broken thing you keep trying to put together can not even compare with that beautiful thing that's waiting to be built. - Mandy Hale. Throw your dreams in to space like a kite, and you do not know what it will bring back, a new life, a new friend, a new love, a new country. - Anais Nin. You are off to great places!, today is your day your mountain is waiting, so get on your way. - Dr. Seuss. I was falling. Falling through time and space and stars and sky and everything in between. - Jess Rothenberg. Never be bullied in to silence never allow yourself to be a victim. Accept no one's definition of your life, but define yourself. - Harvey Fierstein. Heavy hearts, like heavy clouds in the sky, are relieved by the letting go of a little water. - Christopher Morley. Fly free and happy beyond birthdays and across forever and we will meet now and then when we wish, in the midst of the one celebration that can never end. - Richard Bach. Clouds come floating in to my life. No longer to carry rain or usher storm, but to add color to my sunset sky. - Rabindranath Tagone. Whatever end finds us, it would not find us separated. - Stephanie Meyer. The pain is there, when you close one door on it knocks to come in some where else. - Irvin Yalam. to die, by Francine Klagsburn. Do not be dismayed by good-byes. A farewell is necessary before you can meet again and meeting again, after moments or lifetimes is certain for those who are friends. - Richard Bach. While the person who commits suicide dies once, the loved ones left behind may die a thousand deaths wondering why. - Anonymous. And the day came when the risk to remain tight in a bud was more painful than the risk it took to blossom. - Anais Nin. Sometimes what a person needs is not a brilliant mind that speaks, but a patient heart that listens. - Unknown. Death ends a life, not a relationship. - Robert Benshley. The truth is, unless you forgive yourself, unless you forgive the situation, unless you realize the situation is over, you can not move forward. - Steve Maroboli. I know you are not far away. I feel your presence around me. Our love binds us together always. We two are one eternally. - Unknown. Only the wounded healer can truly heal. - Irvin Yalom. Your life is a sacred journey. It is about change, growth, discovery, movement, transformation, continuously expanding your vision of what is possible, stretching your soul, learning to clearly and deeply, listening to see intuition, taking courageous challenges at every step along the way. You are on the path. Exactly where you are meant to be. Right now. And from here, you can only go forward, shaping your life story in to a magnificent tale of triumph, of healing, of courage, of beauty, of wisdom, of power, of power, of dignity, and of love. - Caroline Adams. Praise for the first signs of April. Reading the first signs of April is like sitting in front of a fire with a old friend: Briscoe starts telling her story and all of a sudden the sun is up and you feel as if you have not blinked once. This book will become that friend who stays with you for life. - Melanie Braveman, author of east justice and red. 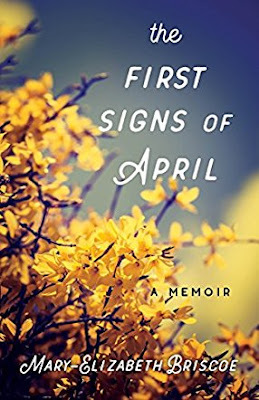 The first signs of April is an inspiring story about life, death, and how connected we all remain – but only if we are open to listening to the wisdom waiting for us. Mary-Elizabeth Briscoe shows us the power of friendship, and the ways we can heal by embracing all life has to offer. - Linda Joy Myers, president national association of memoir writers, and author of song of the plains: a memoir of family, secrets, and silence. By living and writing her truth, Briscoe shares her healing journey of loss and love. A compelling read that grabs your attention and will not let you leave. - Priscilla A. Hutchins, licensed psychologist – doctorate, retired. Synopsis: shut down and disconnected, Mary-Elizabeth Briscoe has lived her life in silence in order to stay alive, her grief is buried, and shame is the skin that wraps around her bones but then, following the brutal murder of a local teacher, she is forced as a grief counselor to face her lifetime of unresolved sorrow will she finally be able to crack the hard edges of her heart and allow in the light so real healing can occur?. Review: I found this book really easy to get in to and harder to put down. I was hooked on this book after reading the synopsis. I was sad to read that Mary's auntie Pat had cancer but it was nice of Mary to help her auntie and uncle around the house and Mary sounds like a great niece as not many young people would help their family. I loved all the poems in this book and l love that there was one at the start of every chapter. I can not put in to words how great but heartbreaking at the same time. It did not take me long to finish reading this book. Mary sounds so brave telling Joy how she feels about her. I was sad to read that Joy was abused but glad she told Mary. When l was reading this book I would put some essential oils in my humidifier and put the lights on my humidifier on and chill on my bed and listen to music or something on TV. I sometimes light a candle when l am reading this book. When l am reading this aswell as cuddling my kitten Oreo or one of the other kittens that live with me (there are three not including mine). It is good to chill reading a good book. I also took a picture of this book to share it to my Instagram that l made just for pictures of my books it is called donnareviewsbooks. I write book reviews at my desk in my bedroom that is also my lining room, library and office. Sometimes I sit on my bed writing book reviews I sometimes put earplugs in so l can read or write book reviews in peace. I was sad to read that Joy committed suicide and Mary feels if she told somebody about the gun that Joy would still be alive. I think Mary should not feel like that as Joy would not want her to feel like that and Joy did not want to hurt Mary or her family. Mary sounds like a great family member to have and a great friend to have too. Her family should be so proud of her and I would have loved a friend like Mary when l was younger because there was no kids like Mary when l was younger. When this book review is posted it is my birthday but it does not feel the same without my grandad who passed away two years ago. I feel Mary's pain as l have lost lots of family members my first loss was my sister Shirley. I feel like my grandad and my cat (who passed away a year ago) is still around my grandad was a smoker too and l smell smoke in my bedroom and l do not smoke myself and when l was reading about Mary visiting a psychic to see if anybody had any messages for her my bedroom smelt like somebody was smoking in it I think/feel like my grandad was telling me he was still around. Stuff would fall off my shelves and at the time I had no cats and I would feel a cat jump on my bed and l would wake up and nothing would be there and it still happens and it is not any of the kittens we have now. Sleeping and reading helped me through my grief. I like that Mary become a grief counselor. I was really sad to read about the murder of Melissa Jenkins. I was sad to read that Joy's parents never give Mary Joy's letter I wish Mary had got to read it as she needed to know how much Joy loved and did not want to her. The christmas gift Mary made Joy sounded nice and Joy gift to Mary was perfect for a writer and I would tell people to read this book for themselves to know how great but heartbreaking it really is. I would love to read more from Mary-Elizabeth Briscoe. I am glad this book is on my book shelves I would love to buy some of Mary's other book as l got this one for free. As it is getting colder I read under my quilt reading. Sometimes l can not read as l suffer from migraines or a headache. Reading this book makes me feel like l am not alone with grief and that it is okay to cry for lost loved ones. I love reading memoirs and about people's life and l love the title of this book and my Nan is also called Mary and my mum is also called Pat. I am really in love with this book. I was sad that it finished l wish it did not end or there was a follow on to it. I would happily read this book again and again. I love that Mary and her sister got tattoo's l have five tattoos myself but me and my sister are planning to get matching tattoos. Memoirs are one of my favorite type of books to read and sometimes when l am typing up book reviews one of the kittens watch me from the window or on my knee. I love the book dedication. I was sad to read about all the death in this book. I reviewed this book on amazon UK and US and goodreads and my blog. About the author: Mary-Elizabeth Briscoe, LCMHC, CCTP is a licensed mental health counselor currently on sabbatical from her private psychotherapy practice in northeastern vermont. After spending a year living on the dingle peninsula, Ireland working on her next memoir she is currently splitting her time between cape cod, vermont and Ireland. Mary-Elizabeth has a masters degree in clinical mental health counseling from Lesley university and is a licensed clinical mental health counselor and certified clinical trauma professional. In addition, she has worked as a lecturer at springfield college school of professional and continuing studies St. Johnsbury, vt. Campus. She is a regular contributor to cape women online and sweatpants and coffee magazines. Mary-Elizabeth loves riding her motorcycle and spending as much time as possible with her dog Fergus. About the book: I love the book cover and the branches with the changing colours. I love that the writing is in white because it makes the writing stand out more.